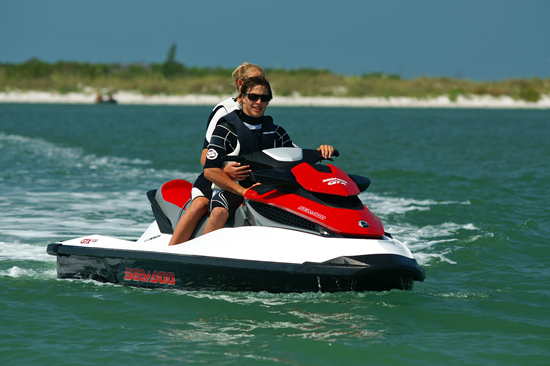 The new Sea Doo Spark PWC redefines “entry level” with a shockingly low price. Here’s the scoop on the new Sea Doo Spark in a nutshell: its hull is made of plastic, it features a choice of the two lowest horsepower engines in the industry, and even kitted-out in its full line of accessories, it’s still one of the most minimalist personal watercraft on the market. So why did I —and the majority of other journalists on hand —leave Sea-Doo’s 2014 press intro with such a positive impression of this new PWC? 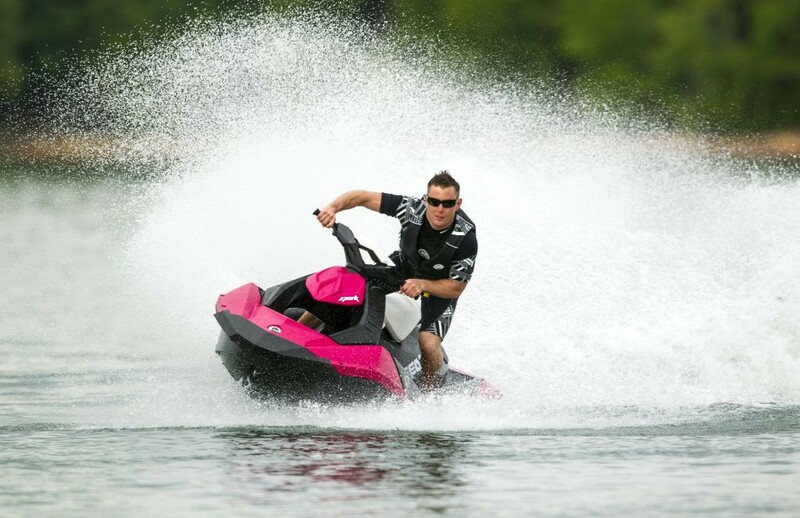 Can the Sea Doo Spark energize the PWC market? It seems like a good bet. At a time when personal watercraft have inched as high as the $18,000 mark, the base model Spark comes in at a paltry $4,999. Even fully equipped with a more powerful engine and Sea-Doo’s Intelligent Brake and Reverse system, it’s still a relative bargain at $7,199. The Spark is also easy to live with. Its light weight doesn't require an SUV to tow it around, and it’s not out of the question to grab one with your buddies and slide it into the back of a pickup truck, something that hasn't been realistic since the stand-up days. And then, there’s the good old-fashioned fun-factor. With its nimble feel, the Spark brings back some of that old-school playfulness that today’s models have long forgotten. It not only carves, it slides and even spins. That’s old-school fun. 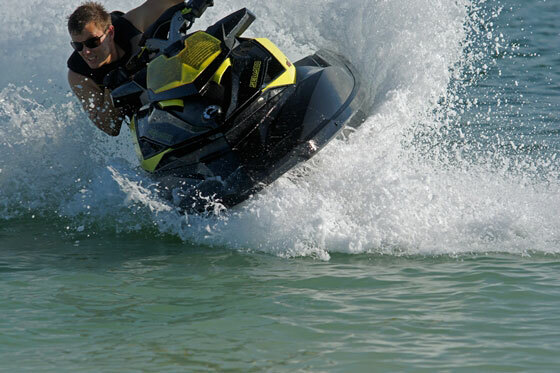 And, as we first told you in the boats.com blog Sea Doo Spark Set to Ignite the Personal Watercraft Market, Sea-Doo believes a new audience is ready to embrace it. The origins of the Spark date back to 2006, when Sea-Doo began a project dubbed CAFE, for Clean, Affordable, Fun, and Easy. Price creep was a problem then as it is now, as was the lack of new buyers coming into the market. To target both issues, company brass decided the brand needed to come up with a dramatically less expensive model, one that would draw some inspiration from the original Sea-Doo SP while breaking new ground. That posed a challenge to designers and engineers, who, in order to reach the necessary price point, had to move away from traditional construction methods. The most obvious example is that plastic hull and deck. Molded from a mix of polypropylene with long-strand glass fibers, it’s both cheaper and lighter than fiberglass. It also results in a matte finish, rather than fiberglass’s traditional gloss. 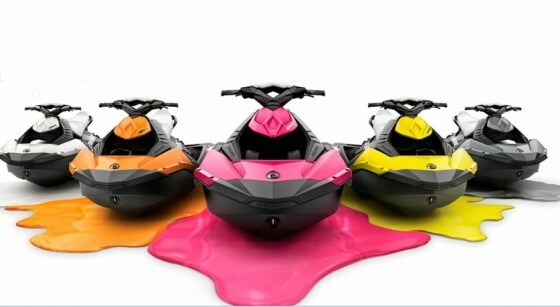 Sea-Doo uses the finish to its advantage, producing a total of five different shades —Bubble Gum (Magenta), Pineapple (Yellow), Orange Crush (Orange), Vanilla (White), and Licorice (Black). Finish and coloration on the Spark is both trendy and goes well beyond the limited color choices found elsewhere. Rather than bond the hull and deck together using an adhesive, Sea-Doo uses bolts and locknuts, sandwiching a rubber seal in between the pair to prevent water intrusion. And instead of conventional motor mounts, the engine is bolted through the hull to aluminum backing plates on the exterior. One of the two plates even functions as the heat exchanger for Sea-Doo’s closed-loop cooling system. The bolted-together bondline offers distinct advantages for service access. 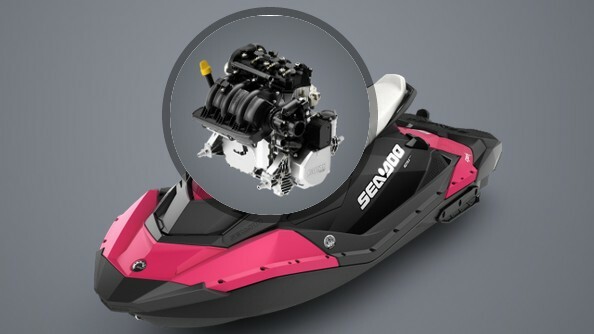 Unlike most watercraft that force service reps to work within the confines of a tight motor compartment, nearly the entire upper half of the Spark can be removed to completely expose both the engine and fuel system. That kind of access usually ends on the assembly line. It’s not even that big of a job to separate the two halves. I watched two Sea-Doo reps walk around a Spark and remove all the fasteners in less than 10 minutes, after which they grabbed the lightweight upper and removed it completely from the craft. Not ready to do that kind of wrenching as an owner? 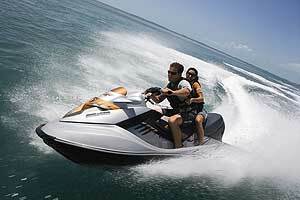 Sea-Doo doesn’t expect it, nor do they likely want you to try. The Spark offers access panels to key items like dipstick, oil fill and battery. The fuel fill and safety kit are located below the craft’s removable seat. Aside from the plastic construction, my first impression of the Spark centered around the gaping hole in the deck just behind the bow. In yet another effort to shave weight and reduce cost, Sea-Doo designers opted to forego the normal closed bow and stowage compartment in favor of a stylish, futuristic exoskeleton that provides additional rigidity without adding on pounds. Reach within and your hand will extend all the way through into the footwells. For those that demand bow stowage, a lightweight accessory compartment secures neatly into the gap. Why the obsession with weight? Because less weight requires less power. 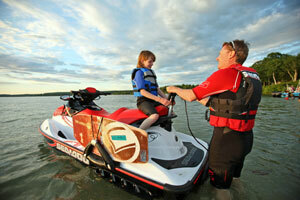 Sea-Doo opted to use the recently developed Rotax 900 ACE, which made its debut in the snowmobile line last season. Designed from the start for both water and snow usage, the ACE is a compact three-cylinder, dual-overhead-cam design that pumps out 60 hp in its base version and 90 in an HO variation. Both are below anything else on the PWC market, but the combined weight of the engine and the Spark hull and deck make for a very advantageous power-to-weight ratio. In my testing, the base 60 hp version (listed at 405 pounds) peaked at about 42 mph. The 90hp HO bumped that figure up to an even 50. Sea-Doo also touts the engine’s efficiency. Using what the company considers an “average” duty cycle, the 60hp engine is claimed to burn only 1.94 gallons per hour, the 90 only 2.4. The Rotax powerplant in the Spark is minimal but is sufficient to pull tow-toys, particularly in the HO version. After riding craft that routinely do 55-65 mph, doing only 42 on a Spark initially seemed slow. Once I began to play around with the boat, however, that impression quickly changed. Rather than tearing across the water in a straight-line blast, my thoughts turned more to the fun to be had carving it through a corner. Weight your outside foot, lean in, and crank the bars, and you’re snapping off crisp turns worthy of the fondly remembered Yamaha WaveBlaster. Or better yet, try sliding the hull out in a 180 powerslide, or maybe shifting your weight forward and spinning a 360 on the nose. I did, and the result was the kind of fun that has been mostly eliminated by today’s ultra-precise machines. Sea-Doo admits they’re targeting the Spark at smaller lakes rather than large bodies of water, and short of daydreaming about its abilities jumping ocean waves, I’d agree with that assessment. I also found the craft best for a solo rider, or perhaps two. 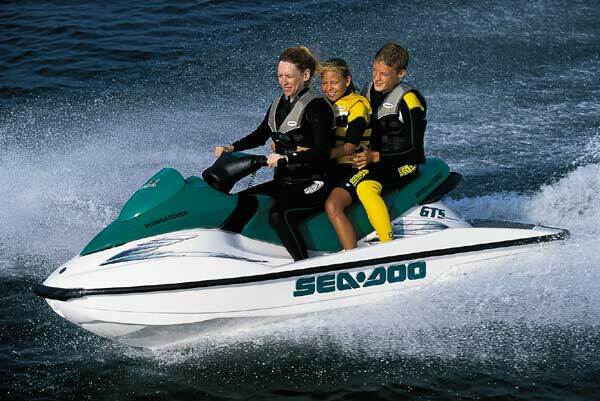 While Sea-Doo offers a three-passenger extension module that adds additional length and buoyancy (increasing capacity to 450 pounds), the latter is ideally suited for two adults and maybe a child. Those who need a full-fledged three-passenger craft, ride on rougher bodies of water, or simply demand higher speeds, will be better served elsewhere. The Spark can, however, do more than just spin and play. To prove its towing ability, the company gladly offered up one of its reps to wakeskate behind the three-passenger, 90 hp version. The company is also targeting the Spark at those who want a more unique personal watercraft. Aside from the multitude of color choices, a collection of 20-plus graphic kits are available to personalize it. Will it succeed? The Spark will surely appeal to those who remember the old days of lighter, more playful craft. 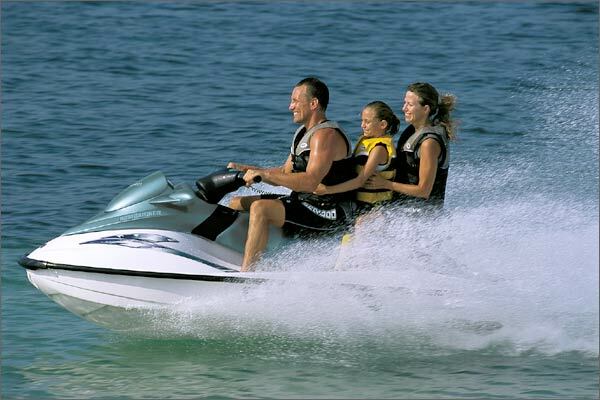 But to truly be a success it needs to go beyond that limited market and entice a whole new generation of enthusiasts to join the watercraft lifestyle. Price has probably been the biggest hurdle to that in the past. That barrier, however, has now been removed—time will tell if the Sparks begin to fly. 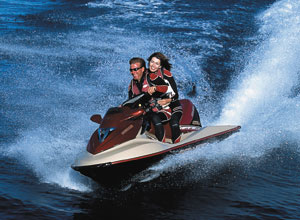 Read Charles Plueddeman's take on this, Sea-Doo Spark Set to Ignite Personal Watercraft Market. 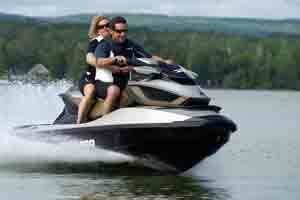 For more information, visit Sea Doo.